From the beginning, the Koch brothers were exploiting troubles at VA hospitals to weaken Obamacare and attack Democrats. As the scandal over waiting lists at Veterans Affairs hospitals exploded earlier this year, there was widespread outrage—and justifiably so, as the country learned that more than 100,000 veterans waited over ninety days for care or never received it. An ever-present force in this debate was a group called Concerned Veterans for America. Its leader, Peter Hegseth, frequently appeared on cable news segments about the scandal, and CVA was often mentioned on the floor of the Senate. Though the group doesn’t disclose its donors, it has for a long while been clear the group is funded in part, or perhaps even in full, by the Koch brothers. Any remaining doubt can now be erased thanks to audio from the secretive Koch donor retreat this summer, obtained by The Undercurrent and reported here. 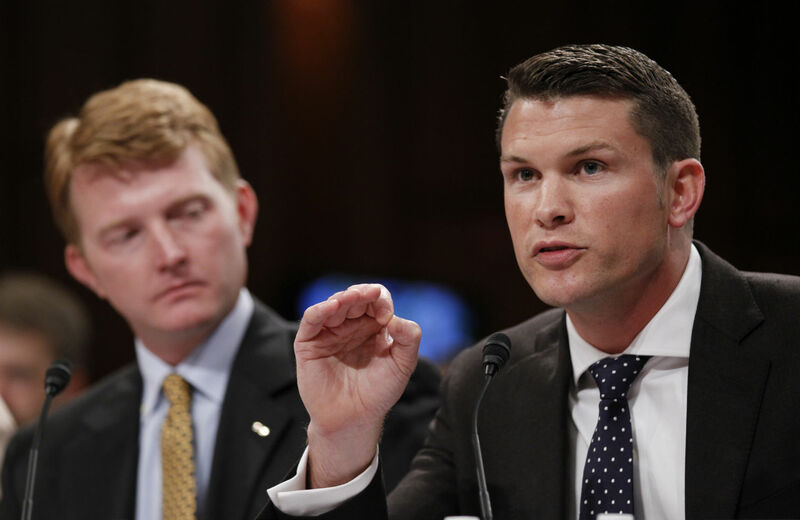 Most notably, during his roughly ten-minute speech, Hegseth outlined how the group was turning legitimate grievances over Veterans Affairs care into a political weapon to attack both the Obama administration and the idea of government-provided healthcare. At various points, Hegseth took pains to express his gratitude to the people funding his operation. “Concerned Veterans for America is an organization this network literally created to empower veterans and military families to fight for the freedom and prosperity here at home that we fought for in uniform on the battlefield,” he noted. “We utilized the competitive advantage that only this network provides: the long-term vision to invest and the resources to back it up,” he continued. Now, unless you’ve been living under a rock for the last couple of months, you know about the crisis at the Department of Veterans Affairs. What you probably don’t know is the central role that Concerned Veterans for America played in exposing and driving this crisis from the very beginning. After years of effort behind the scenes privately and publicly, the scandal eventually made national headlines when initially in Phoenix it was exposed that veterans were waiting on secret lists that were meant to hide the real wait times veterans had at VA facilities of months and months and months. Indeed, CVA played a key role in bringing the scandal to the national consciousness. In early April of this year, a doctor from the now-infamous Veterans Affairs hospital in Phoenix retired and went to The Arizona Republic with allegations of falsified data about long wait times for patients. But despite the story, it remained a local issue. One of the things that helped drive it into the national news was a rally organized by CVA in Phoenix with Republican Representative Dave Schweikert. Not long after, CNN reporter Drew Griffin ran a long investigative piece that sent the story viral. Perhaps most importantly to this effort, we have created a new line of defense against the march towards socialized medicine, educating veterans and Americans in the process. Veterans have had government-run healthcare for decades. We’ve had the preview of Obamacare, and the scandal has exposed the inevitable result of central planning for all Americans: massive wait times, impenetrable bureaucracy, de facto rationing, wasted tax dollars. It goes on and on. Throughout this effort, Concerned Veterans for America, along with our network partners, have intentionally broadened the debate to include big government dysfunction generally, further fortifying a new skepticism that AFP and others have brought to what government-run healthcare does. Ten days ago, the Senate struck a historic deal, a deal that Concerned Veterans for America was central to in every aspect literally ensuring that the language stay focused on real market-based reform, and we pushed the ball across the Now usually deals in the Senate include only one thing: billions and billions of dollars in more spending. Not this one. This deal, as with the legislation in the House, was instead built on two market-based reforms that were injected by Concerned Veterans for America and advanced the entire point, the entire way. He names the accountability measures that allow quick termination of under-performing VA managers, which was initially advanced by Senator Marco Rubio. Hegseth then says the “crown jewel” of the bill is the ability for veterans to obtain private healthcare if they are waiting too long in the VA system. “The latter reform, which seems like a no-brainer to everyone in this audience, is a huge development, rocking the core of big government status quo in Washington,” he claims. Here, Hegseth is engaging in some undue bravado. The option for privatized care is for veterans is significant, though only available to veterans who have to wait thirty days or more for care or live more than forty miles from a VA facility. Hegseth doesn’t mention the provision has a sunset of three years or until funding runs out, whichever comes first. And speaking of funding, the legislation increases the deficit by $10 billion. That would seem to go against much of the fiscal conservatism trumpeted elsewhere in the donor conference. Nevertheless, the Hegseth speech is an interesting window into how the Koch network operates: funding an ostensible advocacy group that is, in fact, a relentless political operation—and one that can, with the right situation to exploit, do everything from take out political attack ads to help craft legislation.